"Tell me if this makes sense: People are paying more for a used first-generation iPhone on eBay and Craigslist than a brand new 3G iPhone from Apple or AT&T. "New iPhone 3G's are being offered at huge markups. New unlocked $199 8 GB iPhone 3G's are selling from $535-$790. I found 16 GB iPhone 3G models going this morning from $700 to $910. "Apple on Friday returned to its App Store an application that makes it possible for iPhone customers to use their high-speed Internet connections to provide Web access to a PC. "Apple has not said why it took down the NetShare iPhone application Thursday evening, but the software's creator, Nullriver, confirmed that the application was available once again. "'We're not quite sure why Apple took down the NetShare application yet, we've received no communication from Apple thus far,' Nullriver said on its site..."
"A tiny company called Nullriver today released what is arguably one of the most useful iPhone applications to date: NetShare. With a tiny bit of configuring, the $10 software allows you to share your iPhone's EDGE or 3G connection with your Mac notebook (or any computer in general). We've compiled an illustrated 10-step guide that we hope will simplify the configuration process and provide an overview of the software for those who may be considering it as a purchase." "On Monday night, I noticed that I had a small crack in my white iPhone that went from the volume button to the metal bezel. I did a bit of searching online a found a thread in the Apple Support discussion forums and a couple of other places. I wasn't the only one with this problem. I posted the story here on ehPhone on Tuesday highlighting this problem. It didn't seem like it was a widespread issue but more and more people began noticing that their iPhones indeed had cracks too. "The cracks seem be be appearing in places where there is a metal piece which is encased by the 'plastic' backing. My crack formed where the volume button is. Some have appeared where there volume on/off switch is. Some have appeared where the sleep/wake button is, and finally some have appeared where the headphone jack is. I think that putting a slightest amount of pressure (i.e. - to lower or raise the volume, turn your iPhone on or off, or even insert the headphones) causes undue stress to the 'plastic' backing. Eventually it is going to give out and crack...."
"Comparing the two - new iPhone software appears faster, more responsive, better contact handling and won't take an age to back-up before sync, see the two compared...."
"The response time difference in the UI is amazing. 4-5 seconds difference in loading the setup screen on the 2.0 seemed like an eternity; sometimes I was afraid my phone had crashed. "Need for speed aside, those wishing to unlock their phones via the Pwnage Tool may want to wait, as the Dev Team is advising a new baseband in the new firmware may be unlockable...."
"Industry analysts have decreed that the new iPhone's lack of security and poor battery life make it unsuitable for all but the lightest enterprise use. "The conclusions come in a nine-page research note from Gartner, as reported by Computerword. Entitled iPhone 2.0 Is Ready for the Enterprise, but Caveats Apply, it is based on analysis of the new iPhone version 2.0 software and 3G handset." PR: Two weeks before the new Apple 3G iPhone was released, a ChangeWave consumer survey showed it was likely to have a tsunami-like impact on the smart phone market. But what does that mean for current market share leader Research In Motion (RIMM)? The ChangeWave consumer survey showed the 3G iPhone catapulting Apple into the lead in terms of planned consumer smart phone purchases for the next 90 days. Note that RIM remains the leader among current smart phone owners in the consumer market, and RIM holds a huge lead in the corporate market. Yet despite its current lead in both markets, RIM isn't taking the Apple 3G challenge lying down. The Canadian manufacturer has multiple plans in motion to counter Apple's momentum among consumers, including an already announced new product release (the Bold) and two likely additional product releases (the Thunder and Kickstart). To get a sense of the market potential for RIM's new smart phone arsenal, ChangeWave surveyed 3,567 consumers on their reaction to the new RIM counteroffensive. The survey was conducted in the aftermath of the Apple 3G announcement (June 17-23), but before the new iPhone model was released. Consumer respondents were presented a brief description containing key features of RIM's new smart phone models, along with a follow-up question asking them how likely they were to buy each model if and when it becomes available. The survey found the new RIM releases each showing considerable potential among consumers once they actually get into the marketplace. A total of 4% of respondents report they're Very Likely to buy the new RIM/BlackBerry Bold when it becomes available. Another 13% are Somewhat Likely. Slightly less positive but nonetheless significant, 2% of respondents say they're Very Likely to buy a RIM/BlackBerry Thunder when available. A total of 13% are Somewhat Likely. Another 2% say they're Very Likely to buy a RIM/BlackBerry Kickstart when it becomes available, and 11% are Somewhat Likely. "These results show consumers hungry for all varieties of BlackBerry," said Tobin Smith, founder of ChangeWave Research and editor of ChangeWave Investing, who added, "it appears like when it comes to the BlackBerry, the adage 'if you build it, they will come,' certainly holds true." The strength of these early survey results on the demand for RIM's new products points to a potentially powerful counteroffensive to Apple's 3G iPhone, according to Smith. "The real losers in this smart phone battle will most likely be the second-tier players, who could find themselves increasingly pushed to the sidelines as the two Goliaths battle for market dominance." To find out which manufacturers are most at risk because of the RIM counteroffensive, ChangeWave looked at the impact of the new RIM releases on the rest of the smart phone industry. The survey found that current RIM customers are two-to-three times more likely to buy the new RIM models than the customers of other manufacturers. The survey also found that the new RIM releases have a significant potential to lure away customers from other manufacturers - with Palm (PALM), Motorola (MOT) and Samsung the most vulnerable. Apple customers, on the other hand, appear least likely to buy any of the new RIM phones. "The US military went into Iraq with few troops able to speak Arabic. Now they can use their iPods to do the talking for them. A new software product, VCommunicator Mobile, and a speaker than plugs into where the ear buds go, enables troops to quickly access a library of phrases. There is also a set of protective covers for the iPod and speaker, with Velcro straps so that you can attach both to your arm. "If all this sounds very soldier-friendly, that's because the product was designed with the help of troops from the 10th Mountain division, who have been using 260 of these specially equipped iPods for the last year. This cost the army $800,000, and included language modules for Iraqi Arabic (it's a distinct dialect) and Kurdish (an Indo-European language spoken in the north). There are also modules for languages spoken in Afghanistan (Dari and Pushto). Over 700 troops are using the device in Iraq and Afghanistan. "The VCommunicator Mobile software and libraries takes up four gigabytes per language, so it can be used on the smaller, and more rugged, Nano iPods. The software displays graphics, showing either the phrase in Arabic, or a video of a soldier making the appropriate hand gesture (there are a lot of those in Arabic.) There are collections of phrases for specific situations, like checkpoint, raid or patrol...."
"If black and white aren't enough for you, ColorWare is now offering their gadget coloring service for the iPhone 3G. Their iPhone site allows you to customize parts of your phone with 35 different colors on an à la carte basis.... Unfortunately, it's not cheap...."
PR: Golf's premier social network, is giving golfers the ability to have a live leader board just like the pros. Golfers can now post their scores and statistics while playing and have their friends, family, and competitors watch their progress live on the Internet. A golfer can use an iPhone, Blackberry, or any web-enabled phone to post their hole-by-hole score. In addition to posting the score, the golfer can also record number of putts, FIR, GIR and driving distance. Then after the round, the golfer can easily analyze the round on Stracka.com. Stracka.com has carved out a niche in the social networking space for golfers. With 200,000+ golfers, advertisers can efficiently target golfers on a local level. Upload videos and use Stracka.com's FREE Swing Analysis tool. "Stracka.com allows golfers to post hole-by-hole scores and interact while they are on the course," said Chase Stracka, CMO of the Stracka Design Company. "Live scoring on Stracka.com will be a great addition to club tournaments so regular golfers can have their own leader board live on the Internet." "We used Live Scoring for our 2008 Club Championship and it was great to watch the scores come in on the Internet. It was like watching the pros play on TV," said Rick Peters, Head Golf Professional at The Bridges in Rancho Santa Fe, CA. "iPhone users can now buy themselves a picture of a red gem to display on their handsets, purely to demonstrate they've got enough money to throw $999.99 at such a pointless gesture. "The application - subtly entitled 'I am rich' - is available through Apple's Application Store, though we're not clear if anyone has bought a copy as yet. Americans are being asked for $999.99, but the UK store is charging a typically overpriced £599.99." "When I was going through a minor existential crisis a few years ago, I read the Bible from cover to cover. The copy I had was the rattiest, oldest paperback version I could find: I got it for two bucks at a library booksale. "The Bible app for iPhone and iPod touch, however, beats even that, because it's free. Bible is published by YouVersion.com, a social website for people reading the Bible that allows annotation and discussion of passages in the book. "Bible includes 13 English translations . . . and includes a 'daily read' tool that - if you stick with it - you can use to read the whole kit and kaboodle in a year. "There are more than 20 other Bible applications available in the App Store, costing as much as $30.... Bible - the YouVersion - is free, and available at the App Store." "According to a post at iPhone Atlas a company called USB Fever is preparing to offer a hardware-based iPhone 3G unlocking device. "The company is taking pre-orders for a US$35 SIM unlock that consists of a micro-controller mounted to a 0.10mm thin piece of FPC that fits between an an operators SIM card and the phone's SIM socket. The device will allow the use of an unauthorized carrier SIM card in the iPhone 3G." PR: Online business simulation experts Minieconomy.com announce the launch of their award-winning strategy game, Informatist, for the Apple iPhone. Currently enjoying wide-scale plaudits and endorsements from schools, colleges, and businesses computer version, the new mobile game is set to continue the runaway success of the original game. Informatist's success is down to the way the game prepares players with the skills needed to succeed in the various intricacies of today's business world, including property development, stocks and shares, the manufacturing industry and much more. By competing with each other, users of Informatist learn how all these components fit together in the marketplace. Thanks to the intuitive user-face and design, the game has proven to be a worthy addition to both scholastic and corporate institutions - now that success comes to the iPhone. "The Apple iPhone offers the ideal platform for Informatist," says Fred Xue of Minieconomy.com. "It's the future of mobile Internet and mobile gaming. As soon as we knew the rollout strategy for the new 3G iPhone, we decided to offer an iPhone-specific build of Informatist. The game uses the most realistic economic simulation engine to offer an enjoyable, in-depth yet intuitive gaming experience, bringing the game to the iPhone was the next logical step for our company." Unlike many other games that make the transition from computer to mobile phone, Minieconomy.com promise that iPhone users will not be shortchanged. The programmers at Minieconomy.com have redesigned the Navigation and Content layout, as well as simplified the Registration process for iPhone users. "We believe we are the first multiplayer online business simulation game on the iPhone platform," states Xue. "This is one of the reasons we have placed so much emphasis on configuring it for this specific platform, and one which users will benefit from immediately." Designed by a team of professionals whose qualifications include Economics, Business Administration, Computer Science and Public Media, Informatist is already proving to be an excellent breeding ground for the next generation of businessmen and women. The introduction of an iPhone version is the next step in Minieconomy's vision to making tomorrow's business world better today. 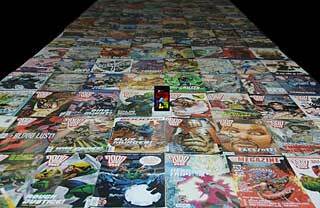 PR: You can now download comics direct to your handset, so consumers can now read comics anytime, anywhere! By going to the 'Apps Store' on iTunes, you can download the Comic Reader application direct to your iPhone/iTouch and then download content to your heart's content. Clickwheel are the first digital comic company to do this. Clickwheel, the world's leading digital comic publisher, has announced that its new Clickwheel Comic Reader application is now available to download for free direct from Apple's new "App Store" on iTunes. Developed to take advantage of the extensive features on iPhone and iTouch, for the first time, the Clickwheel Comic Reader application enables everyone to get the latest exclusive comic strips from the Clickwheel site on demand direct to their handset without having to sync to their computer. Once subscribed to Clickwheel, simply press the Comic Reader button on the main menu screen, choose your comic and download directly to view. To coincide with the launch of the Clickwheel Comic Reader, the UK weekly Sci-fi comic 2000 AD is now available via 'on demand' - an industry first. Clickwheel's Creative Director Will Simons said, 'Clickwheel has been at the forefront of digital comics for many years and the Apple iPhone is the perfect platform for great premium content, giving everyone the flexibility to enjoy comics - from old favourites to cutting edge social commentary - anytime, anywhere." PR: Pennies is a new application for iPhone and iPod touch for personal budget tracking. Available today for $2.99 from the Apple App store, Pennies offers a refined, simple and fun user experience that takes the pain out of budget tracking. Pennies is a new joint venture from Austin Sarner and Clemens Knieper, who have both worked on various Mac projects including AppZapper. Pennies uses a straightforward fuel-gauge style indicator to see how much you've spent. With just two taps you can enter your budget and start tracking expenses. The entire app has been designed to make entering and viewing purchases as simple as possible. Entering expenses is a quick process thanks to built in categories that cover almost any expense. In addition, Pennies tracks your top expenses and allows you to browse your receipts both by date and category. Notes can be added to a purchase, which can be brought up months later using the history feature. Available now on the App Store for $2.99, Pennies is a complete personal budget management solution that fits perfectly on your iPhone or iPod touch. PR: Alta Vida LLC announces Babelingo 1.1, their language translation utility for iPhone and iPod touch. Containing more than 300 useful phrases and words, Babelingo is an incredibly fast and easy-to-use phrase book communicator, allowing anyone to show a professionally translated phrase to a foreign language audience. Babelingo 1.1 for iPhone and iPod touch is only $5.99 and available exclusively through Apple's App Store. PR: TuneCast Auto lets you listen to your iPhone or iPod in the car, while it charges. Cut through the static with ClearScan. Avoid the frustration of manually finding a clear FM station. ClearScan technology quickly scans and finds the best FM frequency - all with one push of a button. 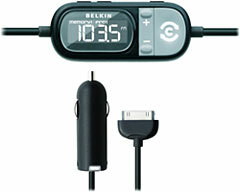 Belkin's current TuneCast Auto for iPhone and iPod now works with the iPhone 3G. By passing the certification testing required by Apple's "Works With iPhone" program, you can be ensured that your iPhone 3G is compatible with the TuneCast Auto. Featuring ClearScan technology, TuneCast Auto will automatically seek out the best FM frequency to play the music from your iPhone 3G in your car by one push of a button. PR: nova media updated 'Phone plugins' to version 2.2, offering context menu support to send text messages and dial numbers with Apple Mail. "Phone plugins works with nearly all phone models from Sony Ericsson, amongst others." states Jan Fuellemann, PR spokesperson at nova media. "The plugin supports multipart and Unicode text messages." Phone plugins is a utility to quick-dial a selected number and quick-send a text message with one click from any program in Mac OS X Leopard and does not require to open any extra application. It is sufficient to select any number and choose 'Dial number' or 'Send text message' within Apple Mail or within any other Mac OS X-compatible application by using the 'Services' menu. Phone plugins will either have the cell phone issue a call and bring up a status window on the screen or open a text message window on the screen accordingly. If the selected number is known to Address Book, Phone plugins will display the appropriate name in the new call window or text message window automatically. In addition, Phone plugins features its own Bluetooth wizard to connect a cell phone to the Mac in one convenient step. Phone plugins is available today for $9.95 (Euro 9,95) plus VAT if applicable on nova media's website. A demo version is provided as well. The update to version 2.2 is free for current owners of a Phone plugins license. Phone plugins requires Mac OS X 10.5.2 or higher and a compatible cell phone from Motorola, Nokia, Samsung or Sony Ericsson. reQall released the first-ever memory aid specifically created for the iPhone and iPod touch. reQall for the iPhone is available for free beginning Friday July 11th, exclusively from Apple's App Store. Based on pioneering research into memory prostheses from MIT's Media Lab, reQall enables you to simply say what you want to remember straight to your iPhone. Your voice reminders are immediately converted into text and delivered back to you at the right moment. reQall can remind you via text message, instant message, email, or as a calendar alert about what you need to do and when. And if you shake your iPhone, the patent-pending reQall Memory Jogger springs to action and identifies information designed to maximize memory reinforcement, helping you remember better. reQall is also smart enough to recognize certain keywords. Say "buy" and reQall automatically adds that item to your shopping list. Say dates and times - things like "remind me to use the travel certificates before May 18? - and a reminder is scheduled in your calendar; use a word like "meet" to automatically schedule a meeting. With reQall, you can even use your iPhone to remind your friends or family members by saying things like "ask Jenny to get the car washed." Jenny will immediately receive a reminder from you by text, email or instant message. You can also take pictures using your iPhone and store these within reQall, so you can remember things that you can't easily describe. reQall's founders and advisors are Apple alumni. "As one of the first native applications for the iPhone, we wanted to create something that was relevant to every iPhone user. And in today's busy digital society, who doesn't need help remembering everything?" says Rao Machiraju, CEO of reQall. "reQall is simple but powerful and has been specifically designed for today's hectic lifestyles." "reQall has long been essential to my life, allowing me to remember without effort. But on the iPhone it has taken a whole new meaning. Combine the iPhone's elegance and large touch screen with reQall and the result is pure pleasure," added Don Norman, former VP of Advanced Technology at Apple and advisor to reQall.